Kenya Basketball Federation Women's Premier League champions Equity Hawks, have booked a slot to represent East Africa at the upcoming FIBA Africa Champions Cup Women 2017 scheduled to take place in November from 3-12 in Luanda, Angola. This is after the team finished second in a hotly contested final match against defending Fiba Africa Zone V champions Kenya Ports Authority (KPA) in Kampala, Uganda at the weekend. Equity Hawks power forward Mercy Wanyama was also named Best Power Forward of the tournament held at the Lugogo Indoor arena in Kampala, Uganda. 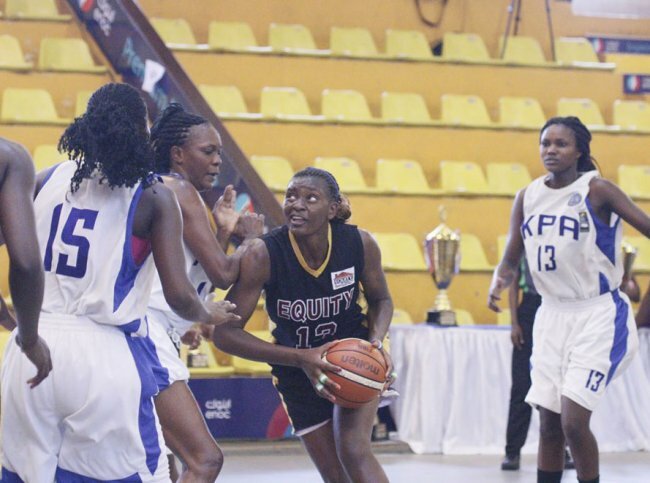 Equity will participate in the tournament alongside compatriots Kenya Ports Authority after the teams topped the 2017 FIBA Africa Zone V championships. Both teams won all their matches expect one each to tie on 11 points but KPA, the defending champions of the tournament was ranked first on a better goal difference while Equity finished second. Speaking after the match, Equity Hawks coach David Maina praised his team’s resilience noting that being their maiden appearance at the regional championships, the team is now able to show the world what it can do. “This championship has been an eye opener to the team and has enabled the girls to display their best form ever. Going into the next stage of the championship confirms that we are ready to meet any team in the upcoming championships”, Maina said. The 2017 FIBA Africa Champions Cup for Women will see 12 teams from across the continent compete for the title of The best basketball team in Africa.